Toronto Police Chief Mark Saunders speaks about the past year and takes questions from the media during a year end press conference at the police headquarter on Dec. 27 2018. As the Toronto Police Service faces a formal call to hire more local officers, an analysis of the service’s ranks shows that three-quarters of its uniformed officers live outside the city. The majority of the force’s roughly 5,000 uniformed members live in surrounding outer suburbs such as Halton, Peel and Durham, according to analysis by The Globe and Mail of partial postal-code data obtained through a freedom of information request – but many also live in communities as far away as Barrie, Ont., and Lincoln, Ont. The debate over the “commuter cop” trend – whether it creates a disconnect between officers and the communities they are sworn to serve, or whether there are valid reasons to keep some distance between the two – was revived this month, after a recommendation by a prominent appeal court judge to boost local representation on police forces across Ontario. itself, 24.7% of the force. 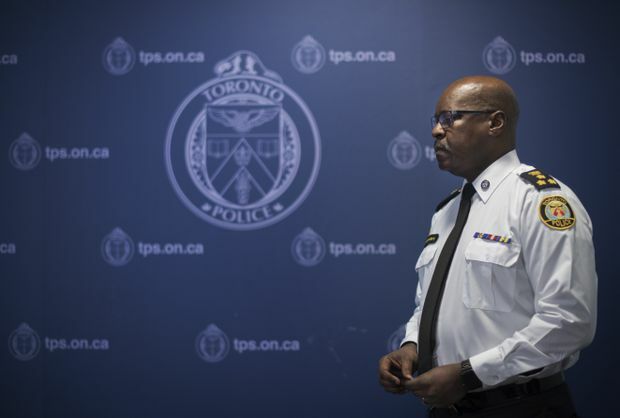 Although there are legal challenges that could make such a directive difficult to enforce, the call comes at a crucial juncture for TPS, after a pledge by Chief Mark Saunders to hire hundreds of new Toronto police officers in 2019. Chief Saunders (who does live in Toronto) has emphasized the service’s renewed commitment to neighbourhood policing, in an effort to strengthen fractured relationships with some of the city’s most vulnerable communities. But despite those efforts, with less than one-quarter of Toronto’s uniformed officers calling Toronto home, critics question the service’s ties to the community. Michael Kempa, a University of Ottawa professor who specializes in policing, says it is reasonable to expect that some police officers will live outside the community. According to The Globe’s analysis, 75.3 per cent of uniformed TPS members resided outside Toronto as of Dec. 10, 2018. Comparatively, in the country’s capital, the Ottawa Police Service said 27 per cent of its police officers live outside its jurisdictional boundary. But in Vancouver – where real estate is notoriously expensive – approximately 83 per cent of sworn officers live outside the city. A challenge for Canadian police services is that under the Charter of Rights and Freedoms, people have a right to the freedom of movement – meaning they cannot be told where to live. Across the border, the New York Police Department has a policy requiring officers to live either in one of the city’s five boroughs or in one of the surrounding counties. Of the NYPD’s 36,376 uniformed members, 49.9 per cent live within the city limits. The other 50.1 per cent live in the surrounding counties. But the NYPD has an additional rule that prohibits officers from living in their assigned precinct, both for safety reasons (what if they run into an angry person they previously arrested?) and in an effort to avoid potential conflicts (what if they are tasked with investigating a neighbour?). In Toronto, in an effort to build trust and relationships with some of the city’s most vulnerable neighbourhoods, TPS launched an “enhanced” neighbourhood policing strategy this fall, in which officers will hold their posts for a minimum of three years. John Sewell, former mayor of Toronto and co-ordinator of the Toronto Police Accountability Coalition, argues that relationships with residents undoubtedly suffer when police live outside the city. “We don’t know very many of them as our neighbours, which is an important thing at the end of the day – knowing people casually apart from what they do in work,” he said. Prof. Kempa offers a political analogy. “For me it’s a lot like members of Parliament. You can have a few star candidates that are parachuted into safe ridings … to perform a particular function – … finance minister or something – but you obviously can’t have that for all your MPs,” he said. Meaghan Gray, a spokesperson for TPS, noted that Justice Tulloch’s report and recommendations were directed to the province, so TPS will wait to see how it responds. “As far as looking at a Toronto residency as a preference or a beneficial aspect to someone’s application, we’ve been doing that for a couple of years now,” she said. Paul Cavalluzzo, a Toronto labour lawyer, says that while a formal residency requirement would violate the Charter right to freedom of movement, a violation can be justified if it is reasonable. In this case, he said a solid argument could be made – but it would likely require the service to reach an agreement with the police association. In his view, the root of the problem is financial. Ms. Gray, too, said the high cost of living is a common theme she’s heard from officers who live outside the city. Mr. McCormack notes that many metropolitan cities that require officers to live locally provide subsidies or financial incentives. London’s government, for example, has previously compensated “key workers” – including police – with housing subsidies. And while Mr. McCormack said he’d welcome such a program in Toronto, he acknowledges it’s unlikely to happen – particularly when the service is supposed to be trimming its $1-billion budget, and when salaries for first-class constables are set to surpass $100,000 this year. Regardless of the root causes, a suburban-dwelling frontline also poses retention challenges for an urban service. As reported by The Globe last year, the Toronto Police Service has been struggling with the issue of officers fleeing for forces closer to home. Between 2008 and 2017, more than 250 officers left TPS for other services. These departures, in combination with retirements, has left the frontline understaffed, Mr. McCormack has argued. Chief Saunders announced last spring that he would be cancelling a hiring freeze implemented in 2017. The exact number of officers TPS will be hiring this year is unknown, but Chief Saunders has said they will be filling roles across the board.